Tacos are good. Tacos with home made flour tortillas are awesome! One day I was going to make shredded chicken tacos for dinner, everything was almost finished, chopped the veggies, reached in the crisper drawer, and there were no flour tortillas! I almost fainted! My son was napping so I could not just run to the store, it was cold and snowy outside, so I didn’t feel like making a special trip to the store. I decided it was time to figure out how to make my own flour tortillas. 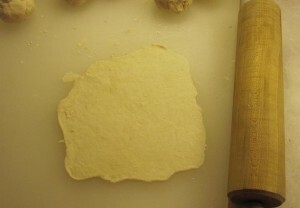 I started researching and there were not very many recipes for flour tortillas out there, plenty for corn tortillas but we are Minnesotans, we only use corn tortillas when we are really feeling crazy! Many recipes included lard, or shortening, some had tons of oil, I wanted to make some that were not super bad for me and used ingredients that I always have in my house, and no, I don’t have any lard in my house! Spend about an extra 15 minutes on cooking up your own tortillas, regular store tortillas don’t compare. 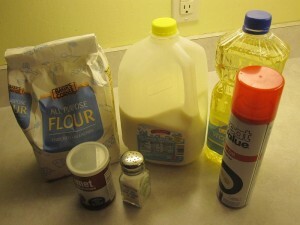 Stir together the wet ingredients, mix together the dry ingredients and slowly add to the wet. Just mix it with your hands, you need to use your hands to get it all mixed in and incorporate any dry ingredients into the dough ball. 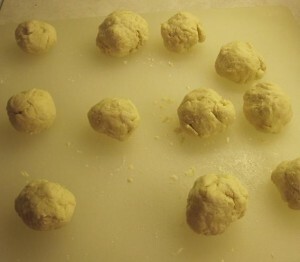 Divide the well mixed dough ball into 8 balls. Pat each ball flat on a clean flat surface. Transfer rolled flat tortilla onto the hot skillet, spray one side with one quick burst of spray canola oil cooking spray and a sprinkle of salt. Cook for about 30 seconds on each side and flip. They should be slightly golden brown. They will come out chewy on the center, with a nice crust on the outside, they puff up slightly when cooking. I store them in aluminum foil to keep them warm until dinner is served. 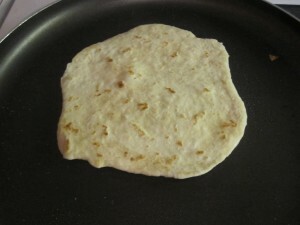 After you eat your first one plain, you will see how much better a taco tastes with a fresh, warm, home made tortilla! When you master this, jazz them up with adding other spices to the recipe, like some chili powder, cayenne pepper, or cumin. One Response for "Flour Tortillas"